The bottles feature works of art by contemporary artists. 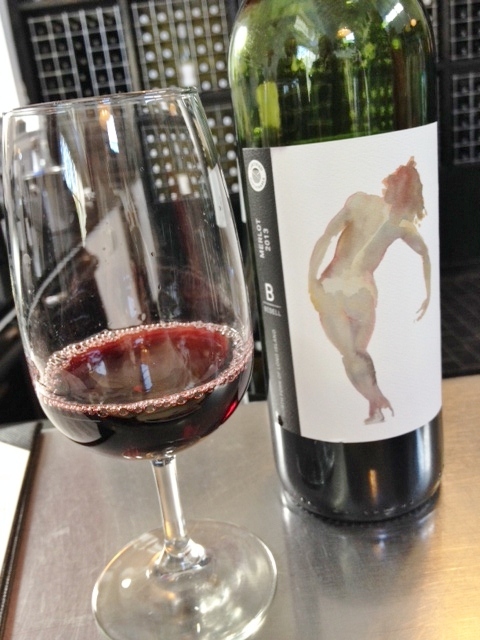 “Our owner is on the board of the Museum of Modern Art,” explained our well-informed server when we commented on the art on the wine bottle labels. “He commissioned Chuck Close to do that one,” she added, as we admired the bunch of grapes on one label. Wow. 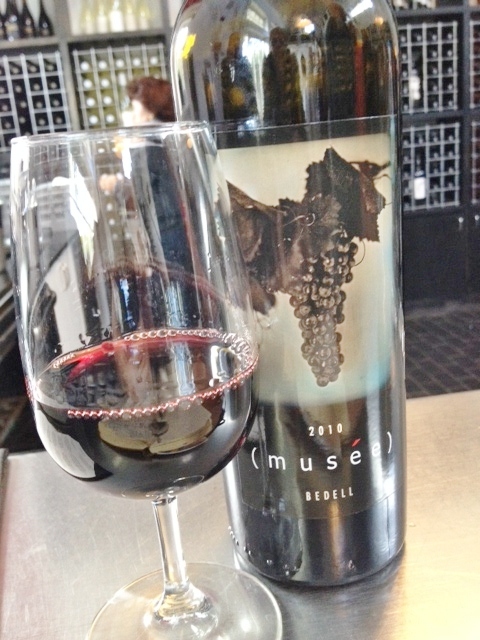 And the prices of the wines also elicited a wow, including the Musée 2010, which is $125 a bottle. You can learn more about the artists and the labels on Bedell’s web page, so I’m just going to discuss what’s in the bottles. 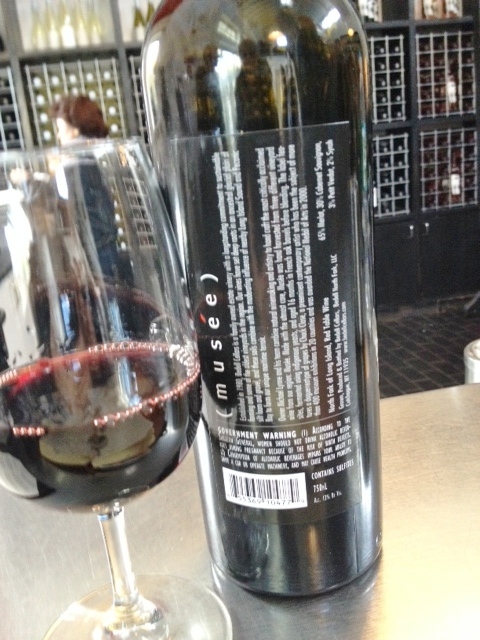 And what’s in the bottles is quite good—though I’m not sure it’s $125 good. The tasting menu offers two options: five Estate wines for $15, or five Premium wines for $20, both featuring three whites and two reds. We decide to share a Premium tasting, which turns out to be a good idea, as the pour is generous. 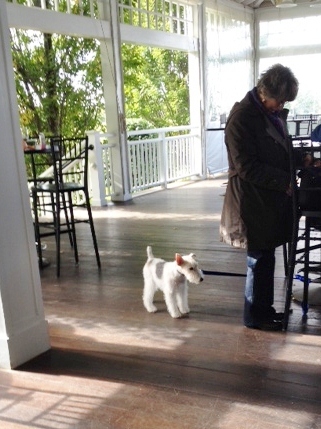 We also decide to return later in the winter to try the other menu. 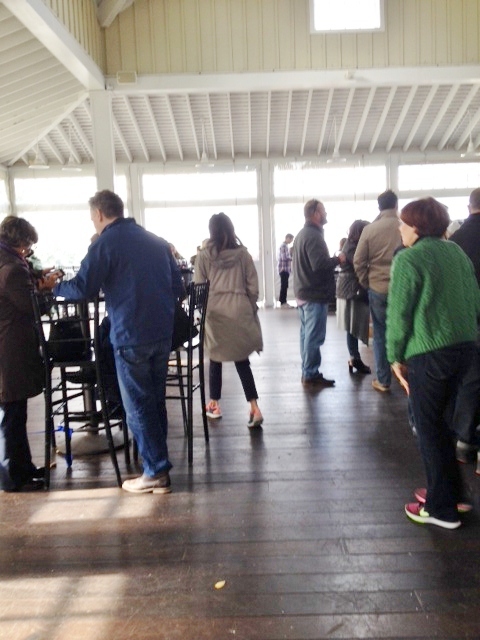 One view of the large porch tasting room. 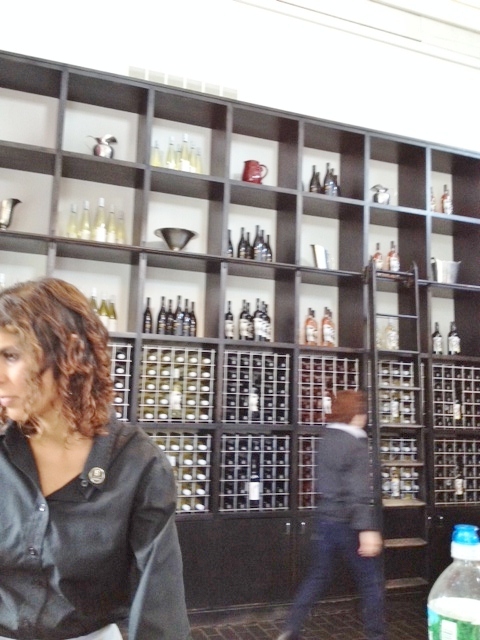 We are standing at the bar, our favorite place for tastings, as this gives us the chance to chat with the servers and observe the scene. 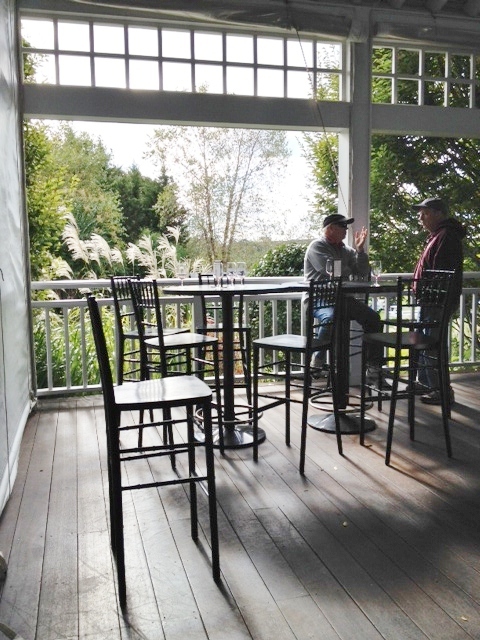 This part of the tasting room is not very large, but an enclosed porch off to one side is much bigger, and is where most of the people doing tastings have congregated on this brisk sunny fall day. It looks to us as though they could use more help behind the bar as it gets quite busy, but the servers do a good job of keeping us in mind, and we’re impressed that they never stop smiling. We start off with a 100% chardonnay sparkling wine, fermented in the bottle using the Méthode Champenoise. Whoa, this is REALLY dry, also crisp and quite good, with a nice minerality and lots of flavor. The aromas include yeast, mushrooms, and celery. As it sits in the glass we get some hints of sweetness. Definitely lighter than a California sparkling chardonnay, it would pair well with goat cheese or a mushroom terrine. Mushrooms are on our mind lately, since we hope soon to check out the local mushroom growers whose storefront always seems to be closed. Mmm, this smells nice, maybe some sticky peach, and my husband says French toast. Maybe. 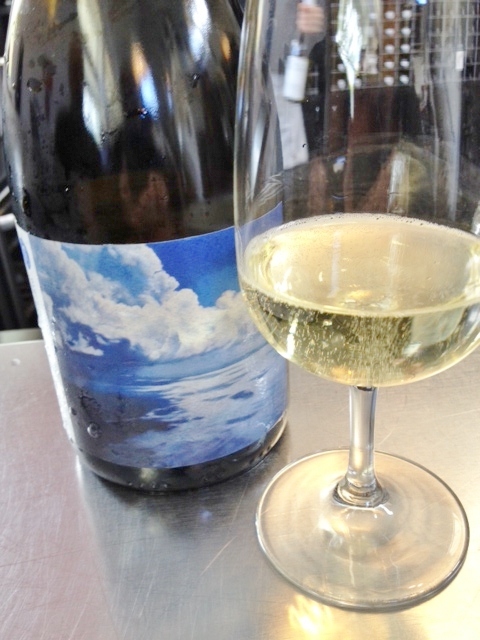 Light, dry, with what the tasting notes call “flinty minerality,” and also some peach tastes, this is a delicate wine that would go well with local flounder lightly sautéed in butter. This is a blend of 70% chardonnay, 24% viognier, and 6% sauvignon blanc, and is described by our server as a “white wine for red wine lovers.” I want to ask her why, but she’s called away at that moment. Perhaps it is because of the complexity of the flavors or the richness of the taste. The wine is first fermented in steel, then spends ten months in new French oak, so it does have some buttery vanilla notes, but not too much. 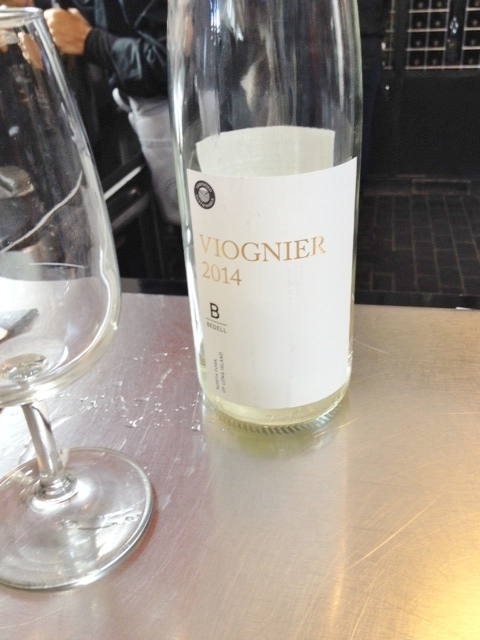 We taste unripe peach, minerals, “hay” (according to my husband), and a touch of something chemical. This starts off seeming quite tart, then gets sweeter, with a slight tingle on the tongue, and I could see drinking it as an aperitif. It would also be fun to give this to people at a tasting and see what they make of it. We get a new glass for each red. The merlot spends ten months in French oak, so not very oaky. We smell some chocolate, maybe Reese’s Peanut Butter Cups, then taste. Briermere blueberry crunch pie, my tasting pal insists. Hmmm. It is very soft, not at all tannic, though dry, and does not have lots of the cherry flavor you usually get in a Long Island merlot. It’s okay, but I see no reason to buy it over many other merlots. I guess you could soak off the label and say you own a Chuck Close print. A Right Bank Bordeaux blend, this is 65% merlot, 30% cabernet sauvignon, 3% petit verdot, and 2% syrah, and features the Chuck Close label. Though the price somewhat takes our breath away, this is a pleasure to drink. It is aged 14 months in French oak, and has lots of layers of fruit flavors, with very soft tannins. Nice mouth feel, and the aroma reminds us of raisins or Craisins. We have had the opportunity to taste very high end French Bordeaux, and this does not quite equal those (at least in memory—don’t know what we’d think in a head to head tasting), but it is quite good. 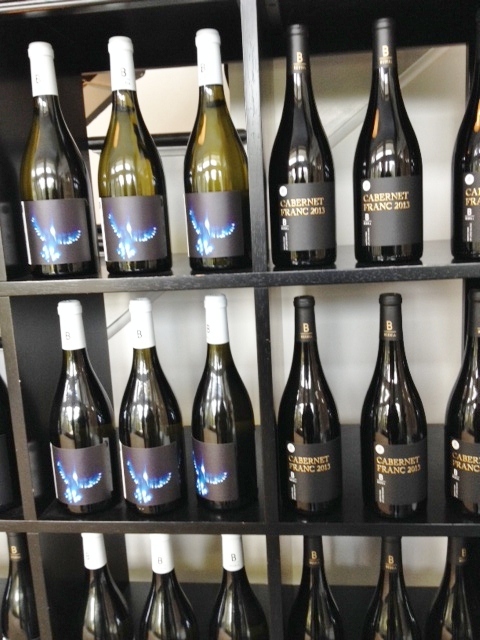 Reasons to visit: the chance to admire some very artistic labels; the Blanc de Blanc, the Gallery, the Musée.